Donald Trump Singled Out This Reporter For Her 'Nice Smile'. How She Responded. "She has a nice smile on her face so I bet she treats you well," US President Donald Trump told Ireland's new Prime Minister Leo Varadkar, referring to a journalist. US President Donald Trump on Tuesday called to congratulate Ireland's new Prime Minister Leo Varadkar, who earlier this month became the country's youngest ever and first openly gay leader. A small group of journalists was allowed to witness the start of the talks - an unusual allowance by the White House. But what happened next has been termed "bizarre." "We have a lot of your Irish press watching us right now," President Trump told Mr Varadkar. "We have all of this Irish, beautiful Irish press here." He then singled out one journalist in particular. "Where are you from," he asked the woman, motioning her to step forward. "Come here, come here." The journalist in question was Caitriona Perry, the Washington correspondent for Irish state broadcaster RTE. 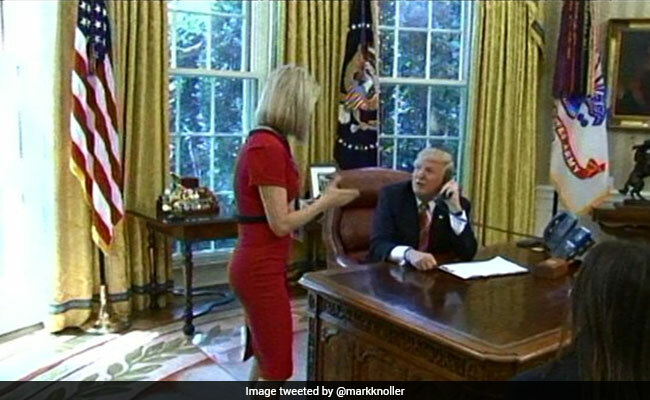 "She has a nice smile on her face so I bet she treats you well," President Trump told Mr Varadkar on the phone in front of journalists in the Oval Office. Ms Perry was shooting the scene on her mobile phone. "He thanks you for the newspapers, Caitriona," President Trump added. Ms Perry initially laughed off the incident. But soon after, she posted a short video to Twitter, terming it a "bizarre moment." Retweeted over 7,000 times already, President Trump's comments have provoked strong reactions on social media. Trump,"She has a nice smile on her face so I bet she treats you well. "Ms.Perry, please accept the apology of at least 1 female American. It's hell to be objectified. When POTUS has no fear of doing that surrounded by cameras... I'm so sorry. Your success is more than a smile. Here's the encounter from Ms Perry's point of view. This video was posted to Facebook by RTE.